According to the Stock Trader's Almanac, three of the last five trading sessions in July are statistically bullish. However; since 1987, August has been the worst month for the Dow and the S&P. Unfortunately, the uncertain climate in 2010 doesn't provide favorable odds of the market avoiding its typical fate during this time of year. However, despite some potentially questionable trade in early August we believe that the money will eventually be made on the long side of the market going into year's end. Commitment of Traders data revealed that small speculators have shifted from short to long and this could make recent market action a bit of a bull trap. Look for strong resistance near 1120/25ish followed by another swift pullback. We can't ignore the market's risk aversion and the political and economic uncertainty, but we also can't ignore discounted price to earnings ratios and decent corporate revenue stats in the second quarter. Equities seem to have amply re-priced in the overshoot of fundamental reality on the bull move that ended in April with the correction. Therefore, while we admit that there could be rough waters ahead we favor being bullish on large dips. We made a similar assumption last month while pointing out a possible spike low to the 1017 area and this eventually turned into a good call. 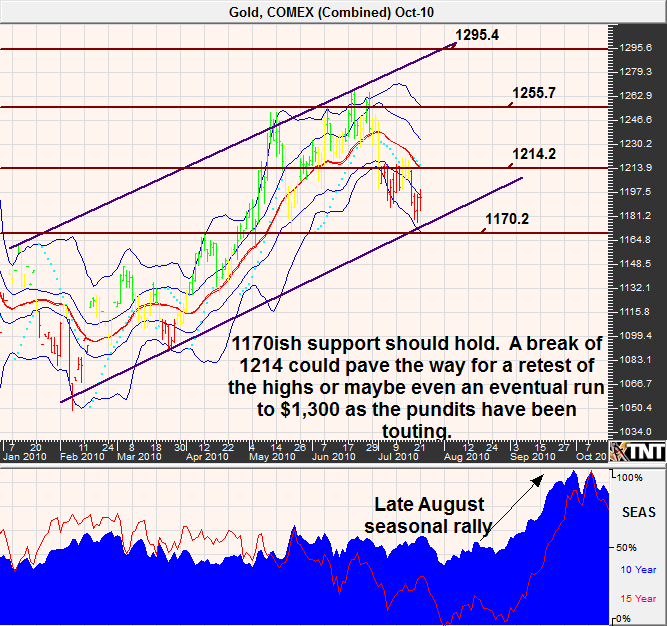 We see support in similar areas this month, near 1040, 1017 and finally just under 1000. 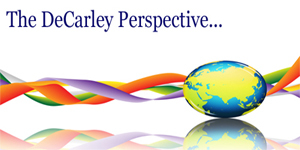 Treasuries have experienced a bit of disconnect from its typical inter-market relationship with the currencies and in some instances even equities. As stocks rallied, bonds and notes managed to avoid any sweeping losses and interest rate traders similarly ignored the weaker dollar. Interest rates remain dramatically low and this has kept the bears intrigued; as we all know the days of low rates will eventually have to end. However, in the meantime the Fed seems dedicated toward keeping the overnight rate at nearly zero and panicked investors have been willing to bid fixed income assets higher and yields lower. The day of reckoning will come, but probably not immediately. After all, equities will need to show signs of stability and seasonal It tendencies are stronger throughout August and inflation is a non-issue. Accordingly, we don't think that the bulls have thrown in the flag just yet. 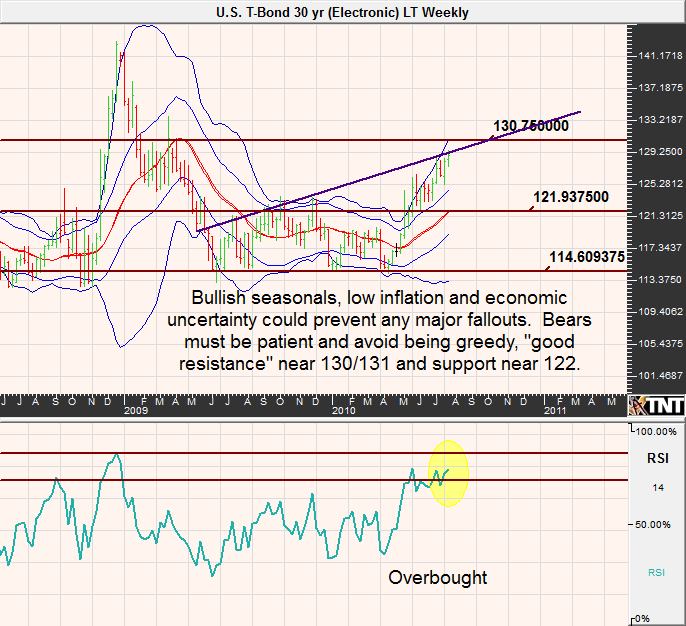 It feels as though the 30-year bond could see prices in near 131 at some point before a larger reversal could occur. Keep in mind that these prices will likely only be possible should equities take advantage of their last month of seasonal bearishness. The so-called "spring" rally in grains came a little later this year but the overall out-come, failure, should be the same. Specifically, soybeans and corn tend to enjoy a temporary rally in which price premium is built into the market to account for uncertainty over growing conditions and crop yields only to fall short at some point mid-summer and decline into the harvest lows. In addition, we are looking for the U.S. dollar to rebound from its recent downturn and the higher greenback could prevent grains from sustaining prices in the long-term. Earlier this month, the USDA announced that it has reduced its estimates of the 2010/2011 U.S ending stocks from 1.573 to 1.373 billion bushels. This is down 1.478 billion bushels from the previous year. With this new information, the revised stocks to use ratio is a dismal 10% (meaning that stocks are only sufficient to meet 10% of demand). While this was the worst seen in 10 years, the global supply demand picture looks better at a stocks to use ratio of 17%. However, the U.S. currently produces about 41% of the world's corn and therefore domestic stats can have a large impact on pricing in this arena. On the other hand, the bears point out that about 2% more planted acreage was dedicated to corn this year and the global recovery could keep a cap on demand. 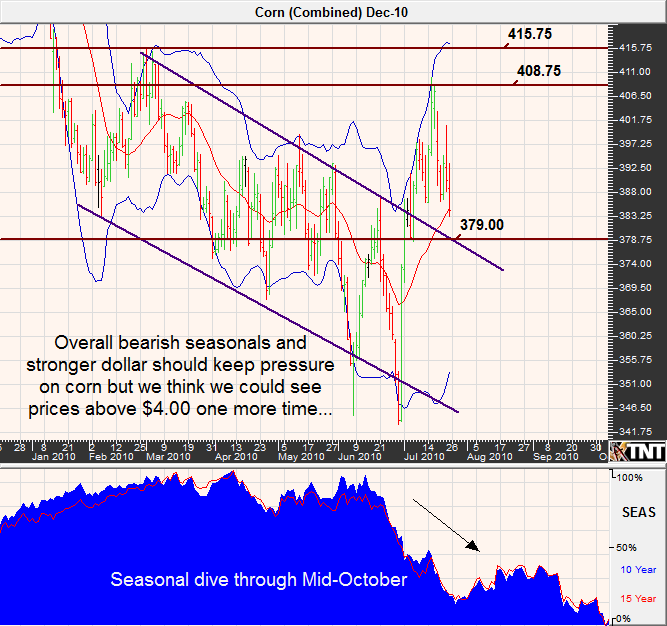 We prefer to be bearish corn, but we see potential for one more move above $4.00 before the seasonal sell-off begins. Throughout much of last year, soybean fundamentals were more supportive of prices than were corn. However, that is no longer the case. The USDA remained firm with their forecast of ending stocks at 365 million bushels and this creates a stocks to use ratio of about 11%. While such a ratio in corn is at the low end historically, this is the most bearish in beans in 4 years. From a global perspective, the stocks to use ratio in soybeans is a healthy 27%. On the other hand, similar to corn, the acreage planted in beans was up 2%. Logic is pointing lower, but the chart says higher, so we are most comfortable looking for a move over $10 before becoming bearish in this market. In recent years we have seen the surplus capacity in crude oil production go from a mere 1.5 million barrels per day to 5.2 billion; all the while demand for crude has remained between 80 and 85 million barrels per day. 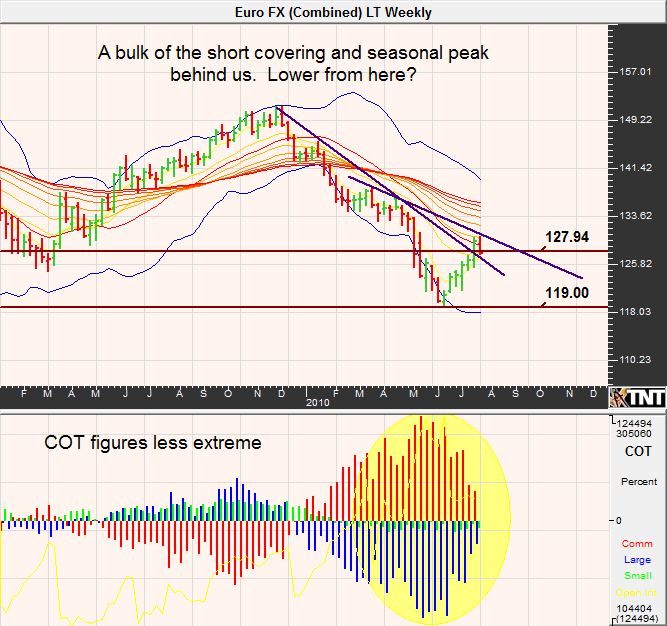 Crude traders seem to have put the European debt crisis behind them and are focusing on more positive fundamentals. For instance, the Department of Energy is calling for total daily demand in 2011 to be just over 87 million barrels and nearly 86 million for 2010. 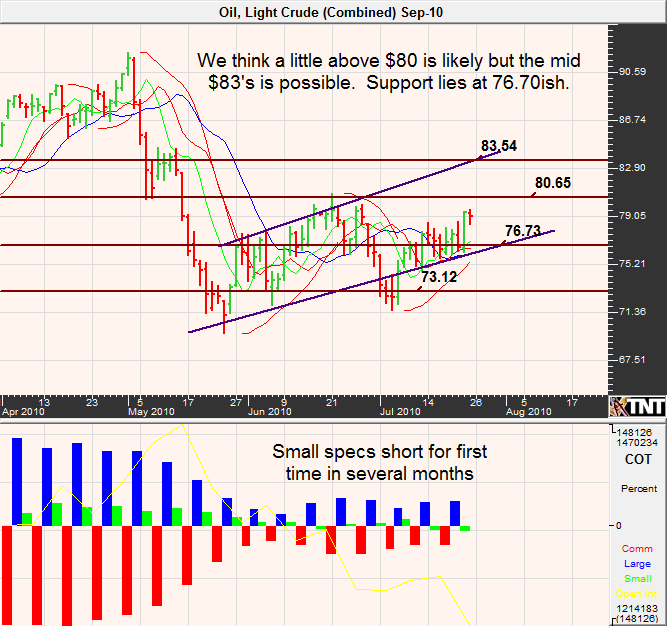 Despite strong fundamentals, crude will potentially face the obstacle of a stronger dollar. As a result, we have a hard time seeing the current rally picking up too much steam. The small specs are short for the first time in several months and this leaves the door open for a bit of a short squeeze. It "feels" like the September futures are shooting for a bit above $80 or even into the $83's if stocks forge a rally but we doubt those prices will be immediately sustainable. We prefer being bears into strength. Natural gas on the other hand, could have a moderately bullish tendency. According to the Commodity Trader's Almanac, purchasing natural gas on July 26th and holding through October 21st has been successful about 58% of the time. That isn't enough to deter bearish plays but it is something to consider before "going short" this market. It used to be a well known fact that Gold was an alternative to the dollar and therefore had an inverse relationship with the greenback. However, that theory has been nearly demolished. Gold and the dollar suffered together as investors moved money back into "risk". According to the World Gold Council, production of gold is up 5% thus far in 2010 but demand is down 25%; nonetheless, the price of gold has seen overall positive trade. Eventually, the fundamentals backing gold prices will have to come into line with pricing and, in our opinion, this would mean lower gold prices. However, in the near-term we can't help but feel optimistic. Aside from a possible retest of the lows, which would likely make way for moderately new lows near 1170, gold could rally with the dollar. If our assumptions are right, a break of resistance just over $1,214 could lead to a short squeeze into the mid 1255's and if the bulls double-up, we might even see a move to $1,300 as all of the pundits have been calling for. With an unemployment rate of 9.5% and a real GDP growth rate of about 2.5%, it is clear that the previous strength in the U.S. currency had more to do with relative fundamentals than positive fundamentals. In other words, the greenback was the "less bad" currency and therefore the market saw it as a quality play to move assets away from risk. However, as we all expected, the markets finally had to admit that being the best of the worst wasn't reason enough for such an unrelenting rally. 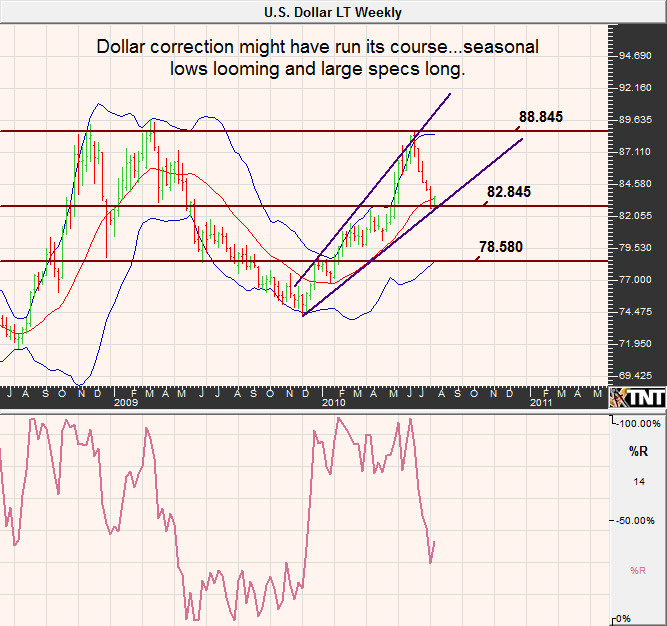 In last month's newsletter we were calling for the September dollar index to correct to the 83 area. The market has since declined a little below our original target but we feel like a majority of the selling might have run its course. It now appears as though we could see 81.60ish before finding "good" support but we will be looking for a resumption of the uptrend from such levels. If we are wrong, the slide could see prices as low as 79.30. 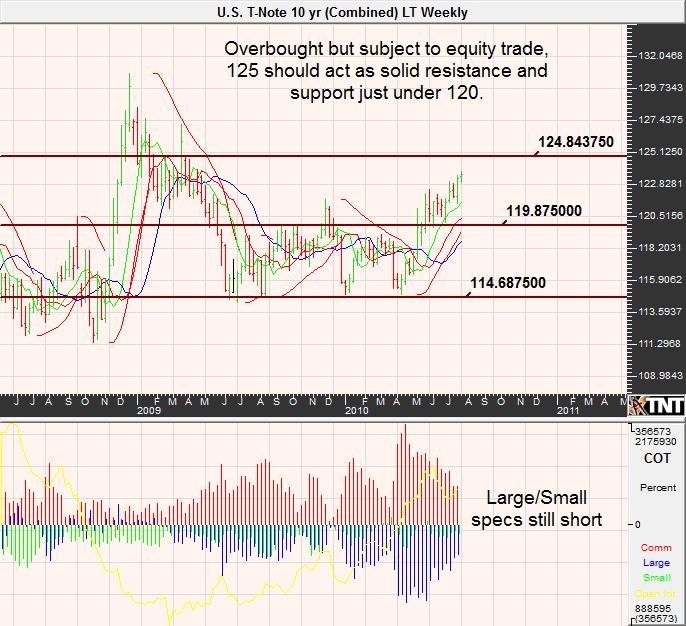 Looking for a low in the dollar translates into finding a high in the Euro. Nonetheless, it seems as though a moderately new high could be in store for the currency before selling comes back to the market. It isn't difficult to imagine several speculators selling the Euro at "bad" prices and taking advantage of the recent dip to exit at a smaller loss than once was. The result could be a quick run to 1.3160 but we have to be bearish from there. After all, real GDP was up only .5% in the first quarter and most estimates of Euro-zone economic growth are at rates of less than a percent. Keep in mind, the COT data no longer suggests that the market is at unhealthy short levels so the upside should be rather limited...if the market pays attention to fundamentals. The USDA is predicting sugar production to be up sharply this year over last. Even the U.N. chimed in, "Preliminary projections for (world sugar in) 2010/11 indicate a small production surplus for the first time since 2007/08, providing some downward pressure on prices." yet sugar prices have been on the rise. We attribute the recent rally to technical trade following the vast decline and seasonal upward pressure as Brazil entered its harvest season. 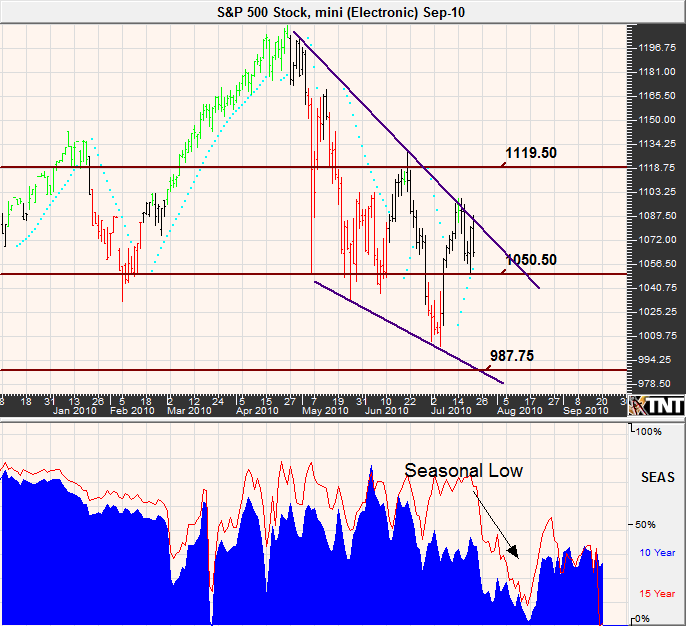 Last month we were looking for a rally but the move exceeded our expectations a bit. This time we are looking for the opposite. Aside from what we think could be some follow through buying into resistance near 19 cents we believe that the odds favor price weakness beginning in early August. First support will be just under 17 cents. The fundamentals backing recent volatility in coffee don't seem to justify the lofty prices reached. In fact, most are attributing the move to pre-mature fund buying in anticipating of tight cash market supplies and speculative stop running in the futures markets. Many of those funds are still holding longs and this leaves the market vulnerable to selling pressure should support be violated. In addition, the growing and harvest weather has been nearly ideal and the USDA is predicting production to be up 11% in the 2010/2011 growing season. 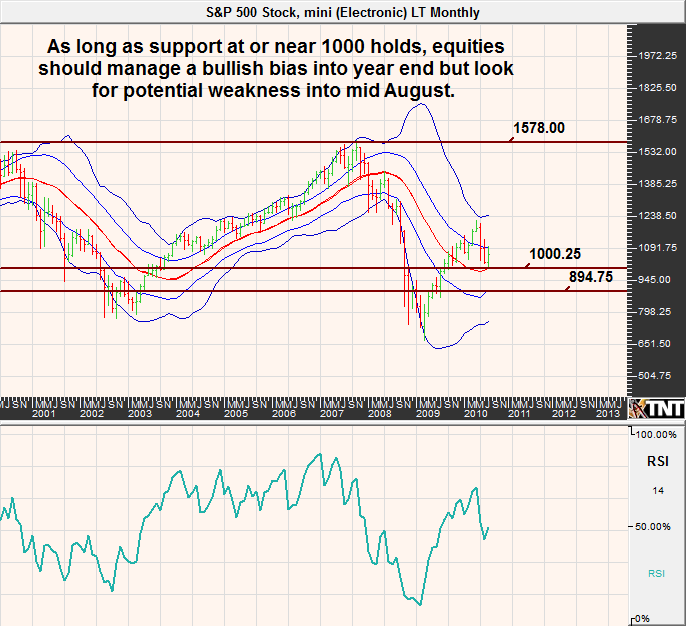 Therefore, we doubt that the rally is sustainable and believe that selling into rallies is the way to play this market. Although we are bearish overall, there seems to be evidence of a technical move that could bring the futures price back to 1.70 at minimum and perhaps even a retest of the highs near 1.75. However, if these prices are seen again it could be a great opportunity for the bears; a short option play in the December 250's or so might be feasible. The USDA announcement earlier this month predicts pork production to be down 3% in 2010, but a 2% increase is expected next year. Accordingly, the news was a relative wash but it did offer the market support and the technical trade might be enough to bring prices back to the highs and then some. 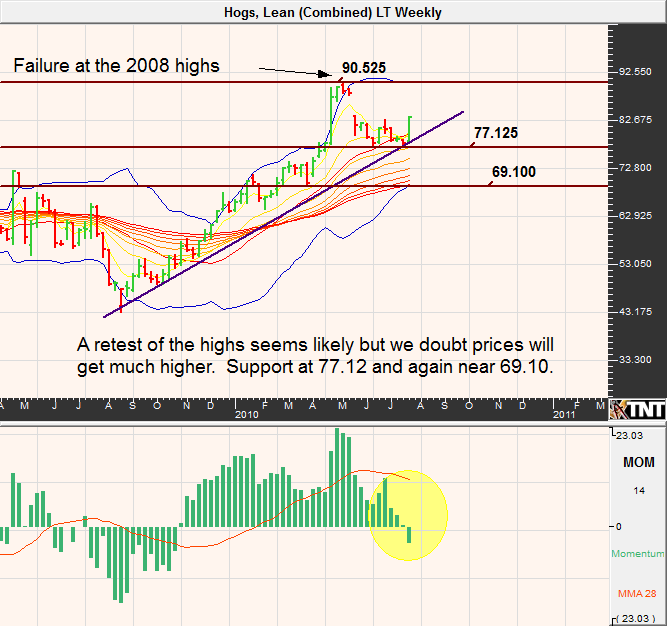 That said, we doubt that the October futures will have enough momentum to break resistance near 79 cents. Strong exports and shrinking inventories have paved the way for higher beef prices. However, the USDA believes that cattle inventories will bottom out in 2011 and this could mean that all of the bullish news is already priced in...for now. Fundamentals might have triggered the rally, but they might not be enough to hold the gains. 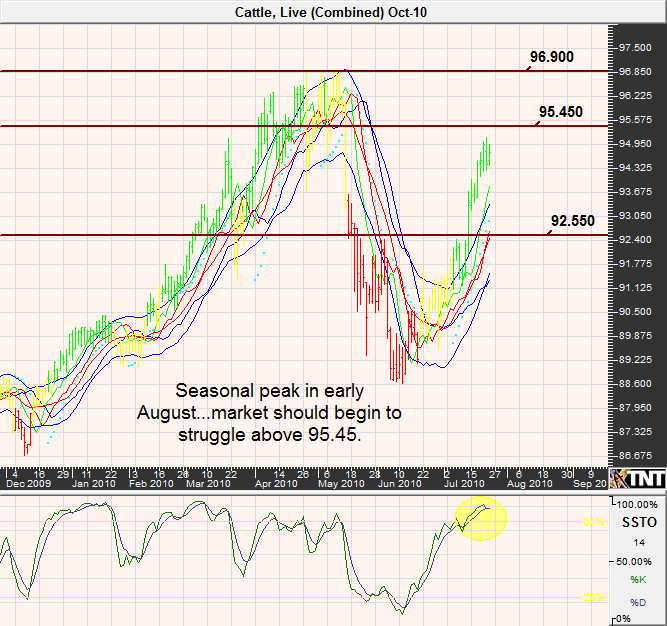 Live cattle futures are facing swift seasonal bearish tendencies and given lofty prices, the market feels a bit vulnerable. That said, we doubt that prices will turn on a dime. 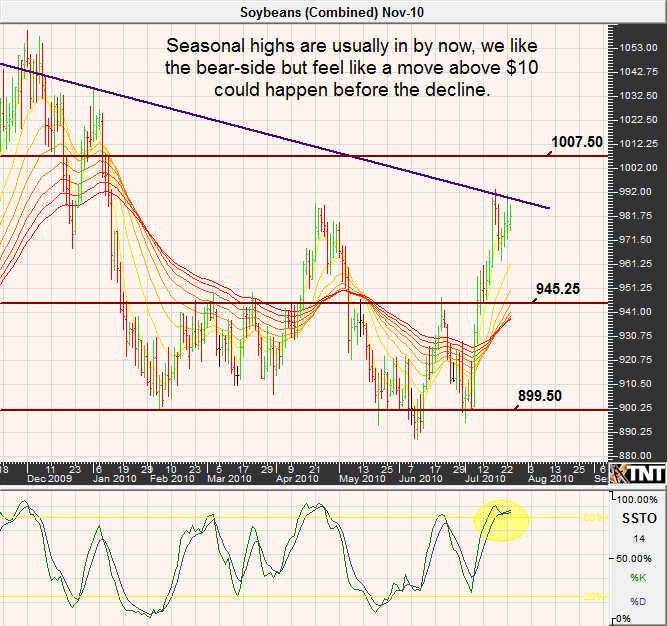 Instead, prices might continue their climb but begin struggling above 95.45 with major resistance at 96.90.